The College has an excellent Library with an exclusive Reference Section housed in the ground floor of the administrative block of the college. It has more than 50,000 books on different subjects. And many encyclopedias and rare books. Transactions in the library are computerized Internet facility has also been provided to the staff and students of the college. OPAC facility has also been provided in the library. College library works throughout the calendar year. Library will be kept open from 9:30 am to 5:30 pm from Monday to Friday and 9:30 am to 2:00 pm on Saturday. Library receives general and special grants from UGC as ours is an autonomous college. 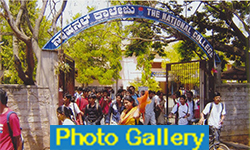 Apart from the Central Library The B.V.Jagadeesh Science Center also has a library which is part of the central library of the college. It has non technical science books and popular science journals and magazines. The Library will be kept open from 9:30 A.M. to 5:30 P.M. from Monday to Friday and 9.30 A.M. to 2.00 P.M. on Saturday. The students must obtain their Fee Receipt before applying for identity card and Library card. Loss of Library card has to be reported immediately in writing. The duplicate card will be issued to students at a cost. The period of loan is fifteen days. If the borrowed book is not returned by the due date, the student will be charged Re. one per day as penal fee (including holidays) and if it is not returned within a fortnight the matter will be reported to the Principal. If the dues are not paid within a fortnight from the day on which they are imposed the amount will be increased by Rs.2/- per day till the payment is made, effective from the due date. Borrowers will be held responsible for any damages caused to the books. Marking or writing in the books with ink or pencil or tearing out pages etc. will be viewed seriously. It is the duty of the students to take maximum care of the library book issued to them. Before leaving the library with the books they have to point out to Librarian the damages if any. Otherwise they shall be held responsible for any damage that may be noticed later. Books from the reference section and periodicals will not be lent out. In the event of a book being lost or damaged the student who is responsibled for it shall have to replace it by a copy of the same edition or pay twice the cost of the book plus postage etc. It is left to the discretion of the authorities to impose a heavier penalty. The loss of the book must be intimated to the Librarian in writing failing which the fine on the book keep accumulating or the cost of the lost books along with penalty must be paid with in the stipulated period. The books issued can be recalled by authorities without previous notice. At the end of the academic year, all the books borrowed from the Library should be returned by the stipulated date and No Due Certificate obtained.